Complete with a beautiful sunset oceanview overlooking St. Thomas and beyond from this gated community filled with luxury vacation rental homes. This 4 BR Holiday Home Rental and four and a half bathroom with pool also features central air, hot tub, as well as lush gardens and landscaping. 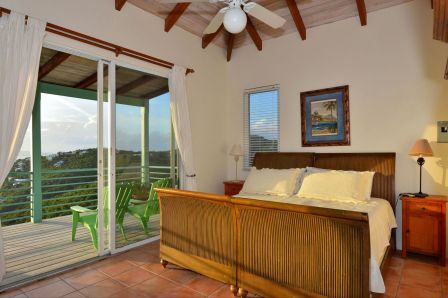 All bedrooms of this stay house have private baths and a scenic deck to view the caribbean sea from. Set with a caribbean motif with Indonesian furnishings; and a spectacular view make this your tropical paradise. Located above the Westin Hotel, walk down to the beach or town with its tropical restaurants and shops; or short drive to magnificent white sandy beaches, palm tree lined; just across from the BVI's; 2/3 island is a tropical national park with private beach coves to snorkel or swim in. 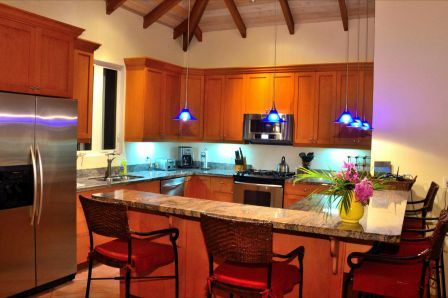 This beautiful St John caribbean vacation rental villa rental retreat is really a must see. 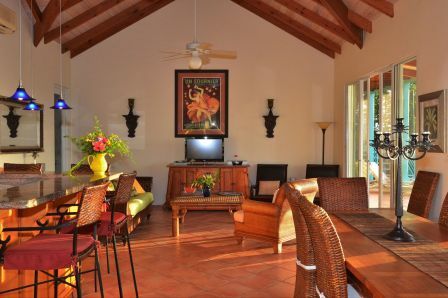 Book this 4 Bedrooms House which Sleeps upto 8 in Cruz Bay Vacation Rentals in $550/Night* NOW!!! In Season (Dec 15-Apr 15) .. 6350/week (2 people) .. 6690/week (4-6 people). Holidays (Christmas & New Years) .................. 8500/week. For 8 People Add $250 per couple. 50% Deposit Due Upon Reservation.